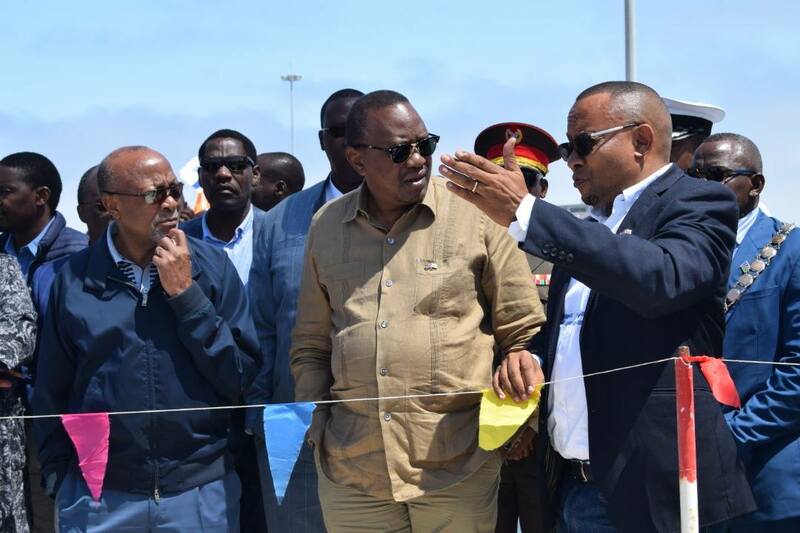 Pictured: The Kenyan Head of State listens intently to the Chief Executive Officer of the Namibian Ports Authority, Mr. Bisey /Uirab, while on a tour of the new container terminal development in Namibia’s main port. Mr. Uhuru Kenyatta was accompanied on his quick visit to Walvis Bay by the Vice President of Namibia, Mr. Nangolo Mbumba. PRESIDENT Uhuru Kenyatta was impressed by Namibia’s plan to turn the Walvis Bay Port into a modern logistics hub that will serve not only the country but all its landlocked neighbours. While on state visit to Namibia the Kenyan head of state visited Namport and the new container terminal development currently in its final stages of construction. The Chief Executive Officer of Namport, Mr. Bisey /Uirab, welcomed Mr. Kenyatta to Walvis Bay and gave presentation about the how the port slots in with the development of dry ports and transport corridors into the sub continent. Mr. /Uirab also told the visiting head of state that the new container terminal that was built on 40 hectares of reclaimed land will be completed by August this year. 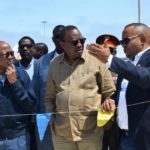 President Kenyatta said the idea of creating dry port facilities for landlocked countries to manage their own import and export affairs is one that can be put to good use at Kenya’s main port of Momabasa to serve its neighbouring countries. Mr. Kenyatta was equally impressed by the creation of the Economic Processing Zones to foster investment at points of entry like Walvis Bay as well as the creation of transport and economic corridors to facilitate trade between land locked countries and the rest of the world. Mr. Kenyatta congratulated Namport with all the achievements it has attained thus far and further called for the exhilaration of the Intra African Cooperation and Trade. “Africa will not be able to succeed as individual countries but if we are to succeed we should only do so as a collective”. Mombasa not only services Kenya but it is also a service centre for surrounding land locked countries such as Rwanda, South Sudan Democratic Republic of Congo amongst others that can be developed to benefit Kenyans. The Vice President of Namibia, Dr. Nangolo Mbumba accompanied the Kenyan head of state and his delegation of ministers on their visit to Walvis Bay.